Welcome to Consultation-Liaison Psychiatry 2018 (CLP 2018), the annual meeting of the Academy of Consultation-Liaison Psychiatry, scheduled this year for the Caribe Royale, Orlando, Florida, November 13-17. 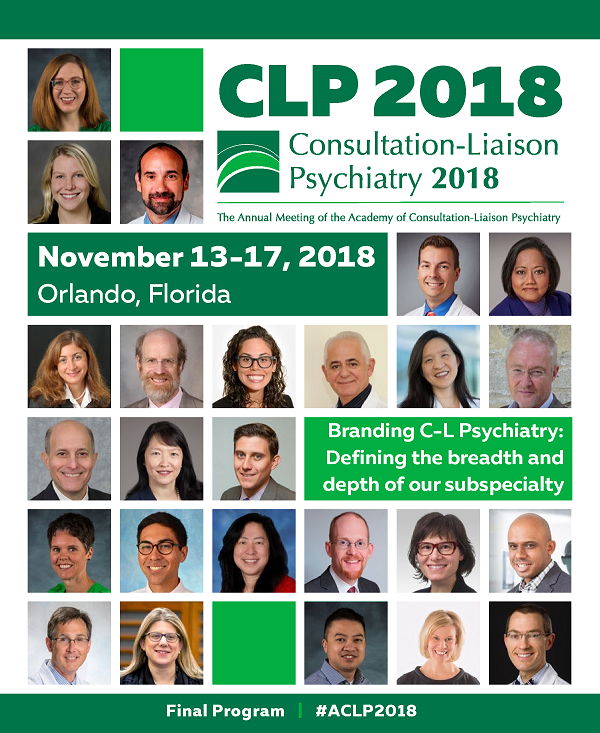 Academy President James Rundell, MD, FACLP, has chosen the meeting theme, Branding C-L Psychiatry: Defining the Breadth and Depth of Our Subspecialty. Clinicians in consultation-liaison psychiatry face a wide breadth of conundrums and controversies in all areas of practice. Our objective for this meeting is to highlight the subspecialties within our subspecialty! Our program this year touches not only on the nuances of the multiple subspecialties within C-L psychiatry, but also will review information imperative for any practicing C-L psychiatrist. You will see that several sessions and events are exclusive to members, and fees overall are heavily discounted for members – consider joining today! At last year's annual meeting, an attendee commented his surprise at my attendance at a session highlighting updates in psycho-oncology. As a perinatal psychiatrist, I see very few patients with primary oncologic diagnoses, however, I view the annual meeting as a forum to update my knowledge base about other subspecialties and hope that other attendees can do the same. An all-day Essentials of Consultation-Liaison Psychiatry preconference course, featuring nine speakers discussing updates on current C-L topics, presented free to members (who also register for the annual meeting) on Tuesday, Nov. 13, then repeated on Wednesday, Nov 14. at half-price for members. Maximizing Mentorship Relationships Throughout Our Careers, a special evening session on Wednesday, Nov. 14, for members only, that will aim to enhance mentoring relationships – both giving and receiving mentorship. Easy access to Orlando's local theme parks and attractions, with free shuttles from the hotel and Academy-exclusive discounted tickets. We look forward to your participation in this challenging and involving program. To subscribe to our e-newsletter for further announcements, please sign up here. Read the Quick Start Guide to get started. If you wish to use the features of this site, you must register for an access key here: https://www.eventscribe.com/2018/CLP/login/signup.asp. You do not have to be registered for the meeting to use this site. In late October, registered attendees will be emailed an access key for this site extending access to restricted content. If you previously registered and already have an access key, your profile will simply be updated to reflect your meeting registration status and give you access to additional content using the same access key.